HCR's formula holds good for all the regular spherical polygons. 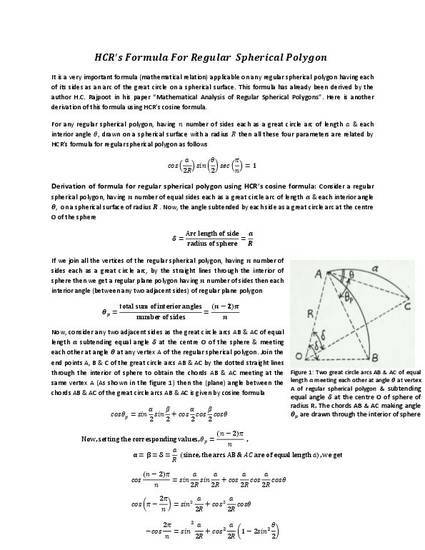 It is a very important formula (mathematical relation) applicable on any regular spherical polygon having each of its sides as an arc of the great circle on a spherical surface. It is of crucial importance to find out any of the four important parameters (i.e. radius of sphere, no. of sides, length of side, interior angle of polygon) if other three are given (known) for any regular spherical polygon. It also concludes that any three of the four parameters are self-sufficient to exactly represent a unique regular spherical polygon. A regular spherical polygon having three known parameters can be created or drawn only on a unique spherical surface of a radius which is easily found out by HCR's formula.